An Aboriginal Wommera weapon is also commonly known a spear thrower or Miru. It is a weapon that uses leverage to achieve greater velocity and distance in spear throwing. The aim of this article is to look at the variety of Aboriginal Woomera. As weapons and as a collectible aboriginal art form. There are several different distinctive styles of aboriginal woomera from different aboriginal tribes. In general the value of a spear thrower will depend on its rarity age and the beauty of the design. I am a keen collector of Aboriginal spear thrower. If you want to sell an aboriginal woomera please feel free to contact me by email and send me some images. The throwing arm together with the aboriginal woomera acts as a lever. The spear-thrower is a low mass, fast-moving extension of the throwing arm, increasing the length of the lever. This extra length allows the thrower to impart force to the spear over a longer distance. This allows greater force resulting in higher speeds and greater distance. The thrower grips the end covered with Spinifex resin and places the end of the spear into the small peg on the opposite end of the woomera. A spear-thrower is a long-range hunting weapon and can make a spear reach speeds of as much as 150 km/h. Spear throwers appear very early in human history in several parts of the world. The antiquity of the spear thrower in Australia is at least 40,000 BP. The ancient skeleton of Mungo Man had severe osteoarthritis of the right elbow indicating he had used a spear thrower for many years. Aboriginal woomeras were useful in warfare as well as for hunting. Wide woomeras can also deflect incoming spears. The Aboriginal woomera sometimes had a very sharp piece of quartz rock inserted into the Spinifex resin handle. This made it a multipurpose tool capable of cutting, shaping or sharpening. The Woomera was also used as a fire-making saw, and a receptacle of mixing ochre, in ceremonies. The designs on aboriginal woomera were also sometimes very personal and empowered them. Woomera from Central Australia and inland Western Australia are by far the most common type of spear thrower. They are collectible because they are often lovingly incised with a variety of designs. Some designs are quite common and other designs very rare depending on which clan/tribe that made them. In general the broader the better and the more detailed the design the more collectible. Older examples usually have a chip carved reverse. Aboriginal woomera from the South of Western Australia are leaf shaped and not incised. They have a bone peg at the top attached by animal sinew and often have an asymmetric spinifex resin handle. They are flat and not convex like Woomeras from the desert regions of Western Australia. Despite being plain there is a certain beauty in their simplicity. Aboriginal spear throwers from North Queensland have Bivalve shells on the handle instead of spinifex. The pins are wood not bone and attached with animal sinew. The most collectible examples have little red seeds decorating the space between the bivalve shells. They are all flat but vary a lot in width depending on the exactly where they come from. The very thin ones and very wide ones are the most collectible examples. These are the most aerodynamic of the woomera weapons when used. Aboriginal spear throwers from South Eastern Australia are rare. They tend to all have early collection dates as Aboriginal Culture changed after european contact. In general spear throwers from this area look like a short wooden harpoon and are quite narrow. They are often carved sometimes with an almost floral motif but can be plain. A few examples were also carved over with designs to sell to early European settlers. They can have resin handles but do not have pins rather a wooden hook. Aboriginals made Spear throwers in this area for hunting but also for warfare along with broad shields. Arnhem land spear throwers are long and thin. They are often over a meter long and have bone pins but lack the spinifex handles. Instead of the spinifex handle, they have distinctive notches on the handle allowing for better grip. When used for ceremonial occasions they were painted in ochres in clan motifs. Painted examples are more collectible. The painted designs on these spear throwers are similar to those on bark paintings. With experience, it is often possible to find out which area and artist created the design. 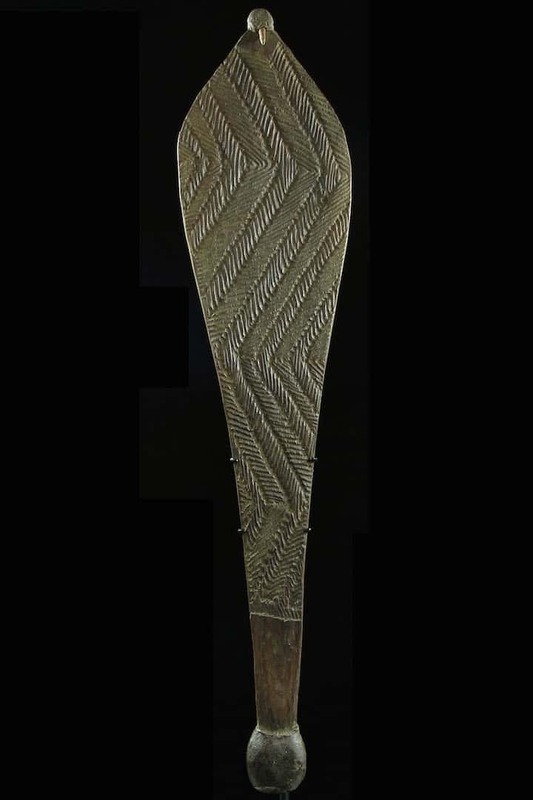 Spear throwers from the Kimberley are like those from Arnhem Land but in general, have a more graceful teardrop shape. They are not incised but are quite often decorated with ochre. What is a woomera and spear used for? Spears were to kill game and enemies. The Woomera was a tool that enabled the thrower to throw a spear further and faster. When was the woomera invented? Woomera were invented in the Upper Paleolithic period between 10,000 and 50,000 years ago. If this post has been informative please take the time and make the effort to share it on social media. By clicking any of the share buttons below you create a link from your social site to this article. Links are what google uses to calculate what information on the web is useful. By sharing this article you are letting google know you found my article / images of some value. Thanks!